The Ardmhéara will attend a conference on the status of the City of Jerusalem at the invitation of the Palestinian Authority. 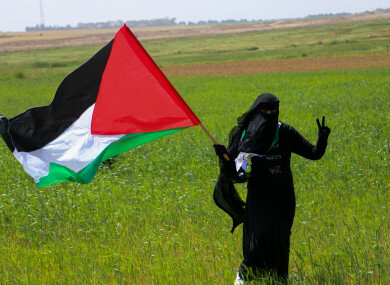 Protests took place this week along the Israel-Gaza border. THE LORD MAYOR of Dublin will travel to Palestine tomorrow to attend a conference on the status of the city of Jerusalem. Mícheál Mac Donncha will attend the conference in Ramallah at the invitation of the Palestinian Authority. As Lord Mayor of the capital city of Ireland I am travelling to acknowledge that East Jerusalem is the designated capital of Palestine under the two-state solution, recognised by the international community, but forcibly prevented from being implemented by successive Israeli governments. I am also here to express solidarity with the people of Palestine who are suffering violence from Israeli forces, as witnessed in Gaza most recently with the shooting down of protesters. The Tánaiste and Minister for Foreign Affairs and Trade, Simon Coveney TD, today called for calm in Gaza as nine Palestinians were killed last weekend in confrontations between Palestinian protesters and Israeli forces along the Israel-Gaza border. 31 people are estimated to have been killed in Gaza since protests began at the end of last month. Most of the 1.9 million people there have never been allowed to leave this tiny area, and young Gazans are vulnerable to despair, without the possibility for normal ambitions and plans for the future. The long-standing blockade of Gaza cannot be accepted as normality. Email “Palestinian Authority invites Dublin's Lord Mayor to attend conference on Jerusalem ”. Feedback on “Palestinian Authority invites Dublin's Lord Mayor to attend conference on Jerusalem ”.